Unemployment in the Wide Bay-Burnett region has fallen for the third year in a row, according to the latest Small Area Labour Markets (SALM) data compiled by the Department of Jobs and Small Business. After peaking in 2015, unemployment has declined for three years in a row in the South Burnett, Gympie, Fraser Coast and Bundaberg council areas. It has also declined for the past two years in Cherbourg. The latest SALM data shows unemployment fell by 0.5 per cent in both the South and North Burnett between December 2017 and December 2018. It also fell by 0.7 per cent in Cherbourg; by 0.8 per cent in Gympie and Fraser Coast; and by 1 per cent in Bundaberg. 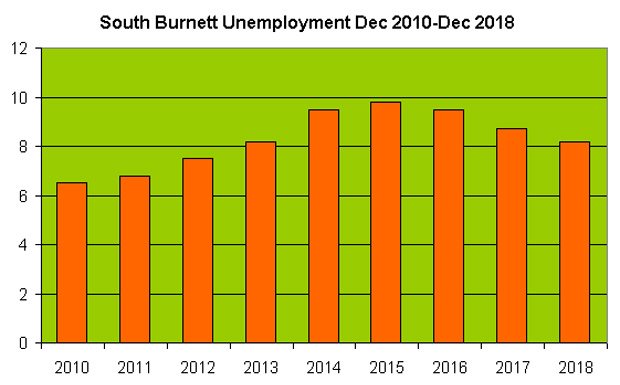 The South Burnett’s unemployment rate is now 8.2 per cent, a figure last seen in December 2013. South Burnett Mayor Keith Campbell welcomed the news. “This is a great result for our region and a good indication of the heavy lifting being undertaken by businesses and industry,” the Mayor said. Well the stats simply cannot be denied now, can they? While there is still plenty to do, the numbers show the results that our representatives can’t avoid or hide under noise. From 2012 to 2015 the LNP ran Queensland under Campbell Newman, and many current LNP MPs including the sitting member were a part of it. Then from 2015 to 2017 (as a minority government), then from 2017 to now (as a majority government), it’s been led by the Palaszczuk Labor Government. Thanks to increased investment and funding, through grants and Regional Council funding programs, the change is evident. And despite the slow uptake, the benefits are on display. The biggest project Labor is delivering for the region is the Kingaroy Hospital’s construction, which will kick off soon. Perhaps working with instead of constantly opposing can lead our region being a beneficiary after all. Top stuff!